The Great Dane was a sad case. She came to Doberman & Rottweiler Rescue in Paris, IL, with such a bad case of mange that walking across carpeting made the pads on her feet crack and bleed. She was so malnourished that, though she was about a year old, she was about the size of a 7-month-old. She also had an immune disorder that required expensive medication. 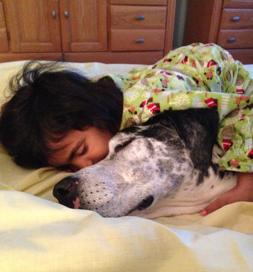 Lucy likes to sleep cuddled up with Thalia, 5. Her rescuers had to have wondered who would take on such a dog as they posted her for adoption on Petfinder. “Two sisters from the South Side of Chicago, that’s who,” says Danielle, one of the two. “When I graduated from college in 2004, I was living with my sister.” That’s when they adopted Lucy Lu. 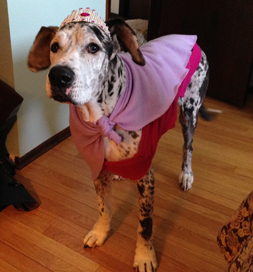 Princess Lucy Lu makes her royal entrance. Perhaps her best role is playing princess with the kids because she is just that, a princess, to her extended family. Learn why all dogs should wear collars and tags.